155 mm/60 3rd Year Type5 х 3 pcs. 203 mm/50 3rd Year Type 2 GO mod. E5 х 2 pcs. 25 mm/60 Type96 Triple mod. 18 х 3 pcs. Mogami — Japanese Tier VIII cruiser. Mogami was built as a light cruiser whose characteristics would largely exceed those of her contemporary counterparts. She had good armor along with a powerful artillery and torpedo armament. During the course of her service she was transformed into a heavy cruiser, as intended by the original design. Mogami-class has a rather unique style in gameplay among all the cruisers at the current iteration as she can have two modes of offense: her 155's which can burn or pummel ships or the harder yet slower loading 203's which technically turns her into a heavy cruiser. The 155's guns comes at her stock hull as she was actually armed with them before being reformatted and reclassified as a heavy cruiser in between 1938 to 1939. The 203's make her into a standard heavy cruiser that has good damage at the cost of slower loading time and reasonable turret turn although this gives her the much needed punch to deal with other heavy cruisers and potentially battleships. Whatever guns you mount, you will find her to be one dynamic ship at her tier. Modular gun system which gives you freedom of play style. 155's have a high initial shell velocity at 925 m/s, making them very good at hunting destroyers. 155's have superb HE penetration if player has Inertia Fuse High Explosive skill. 203's have good firing arc and turret rotation speed. the AA suite is insufficient to defend yourself alone. 155's turrets have a good chance to be incapacitated, if not outright destroyed. 155's turrets turn slowly at 36 seconds for 180 degrees. Without Inertia Fuse High Explosive skill, 155's will have problems against battleships or other highly armored ships as 155's will not penetrate 32 mm of armor, forcing the player to rely on HE to deal damage and set the superstructure and deck on fire. 203's have lesser damage per minute when compared to her 155's. 203's reload time is slower than Myoko's by a second. Inconvenient torpedo tube placement, very limited arc. It is suggested to research Hull B first to get more HP, then acquire the upgraded Fire Control System to kite away ships better, and finally Hull C for more Anti Air guns. As for the gun options, the 155's are best to use (with Inertia Fuse High Explosive skill) if players want to keep the ship in the port. The 203's are generally optional as the 155's with Inertia Fuse High Explosive can deal better damage, meaning it can be skipped entirely or researched depends on player's choice. The 203's however, unlike the 155's, does not need to use Inertia Fuse High Explosive skill as it has enough HE penetration to damage 32 mm of armor. Mogami is a ship with good handling and can be used to kite battleships and other cruiser from afar and tank damage by dodging enemy shells and/or torpedoes. Slot 2: Steering Gears Modification 1 ( ) to keep the rudder in action. Concealment Build: Currently the most popular build of the ship. Captains wishing to focus their Mogami to maximize her concealment will opt for Concealment System Modification 1 ( ) in Upgrade Slot 5. This will lower her surface detection up to 9.4 km, enabling her to do stealth torpedo attack since her torpedo range is 10 km. This can be used to ambush ships with more than her concealment. 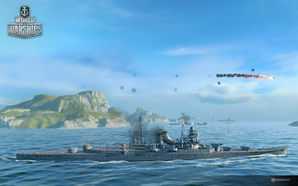 Although, stealth torpedoing will make Mogami prone to radar scan by 9.5 km or more radar-equipped ships like Indianapolis, Baltimore, Neptune, Missouri, Des Moines, Minotaur, and the Russian cruisers. Furthermore, Mogami has bad torpedo firing arc, with the arc only good enough to fire an incoming ship from behind. Maneuverability Build: A rather advanced build of the ship. Captains wishing to focus their Mogami to maximize her maneuverability will opt for Steering Gears Modification 3 ( ) in Upgrade Slot 5. This, when combined with Steering Gears Modification 2, will lower her rudder shift time up to 3.4 s, while maintaining 10.3 km surface detection range. 3.4 s rudder shift time can turn Mogami into one of the best kiting ship. Excellent rudder shift time, good turning radius, and great deceleration making her very hard to hit with the right hand. This, however, has to be paid by her concealment as Steering Gears Modification 3 have the same slot as Concealment System Modification 3. Absolute knowledge of situational awareness is also needed to know when and where to shoot and kite. As Mogami is a fragile ship with no heal, having Damage Control Party II ( ) is generally recommended to lessen the damage taken by fire and/or flooding. Although her AA is insufficient, having Defensive AA Fire over Hydroacoustic Search is recommended as you want the panic AA effects so you can dodge incoming torpedo and bombs coming from enemy aircraft carrier(s). The Mogami class was a series of four heavy cruisers built for the Imperial Japanese Navy during the 1930s. The four ships were Japanese cruiser Mogami, Mikuma, Suzuya, and Kumano. In order to bypass the London Naval Treaty's restriction on heavy cruisers, they were initially armed with 155mm guns despite the class being a heavy cruiser in every other way. Once Japan withdrew from the treaty, the 155mms were replaced with the 203mm guns that the class was designed for and the replaced turrets were given to the Yamato class as secondary armament. All four of the class were lost in combat. Mikuma being the first sank during the Battle of Midway, continued by both Mogami and Suzuya at the Battle of Leyte Gulf, then ended with the sinking of Kumano by USS Ticonderoga. This page was last modified on 3 August 2018, at 13:04.